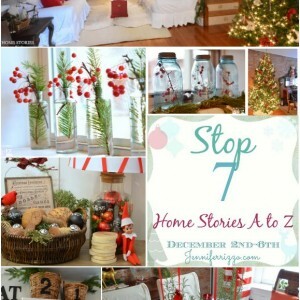 Last week, I shared with you my Christmas Home Tour. If you missed the tour, be sure to check it out here. One of my favorite rooms on the tour is my kitchen! During the holiday season, our kitchens typically see the most action of any time of the year. We bake Christmas cookies, make meals for entertaining, and host holiday parties all from our beloved kitchens. 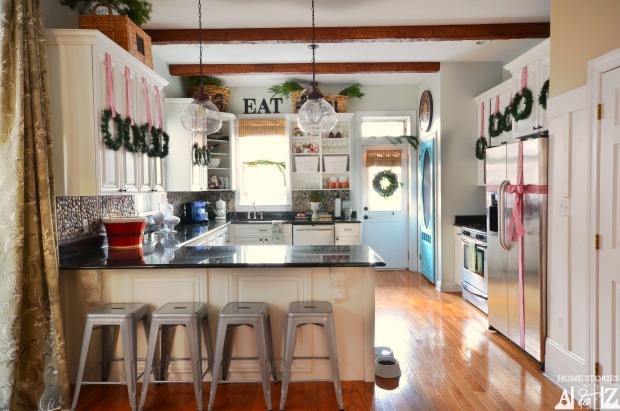 Today I wanted to share with you some easy tips on how to decorate your kitchen for Christmas. Tip 1: Use dollar store wreaths on your cabinets. I bought 12 small dollar store wreaths last year to hang on my cabinet doors. The red houndstooth ribbon was scored for $.99 a roll at Joann’s. To hang the ribbon, I used painter’s tape on the inside of each cabinet. 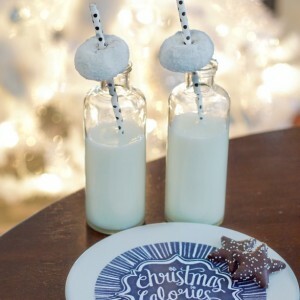 This is an incredibly inexpensive way to add a big-punch-of-Christmas-cheer to your space. Tip 2: Use free items from nature when you can! There are a bunch of trees in our neighborhood that grow these pretty red berries, and I couldn’t resist helping myself to a few sprigs. We live in the city and these trees belong to the city and not a homeowner, but obviously before helping yourself to someone else’s foliage it would be prudent to ask permission first :). The greens in the baskets were gathered for FREE from Lowes. Most places that sell live Christmas trees will allow you to pick from the clippings pile for free. If you have the patience and time, you can also make fresh green garlands and wreaths from free clippings. 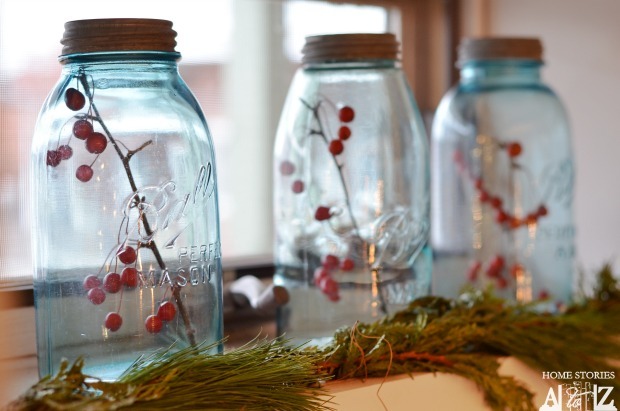 Sticking berries in mason jars couldn’t be simpler or more beautiful! 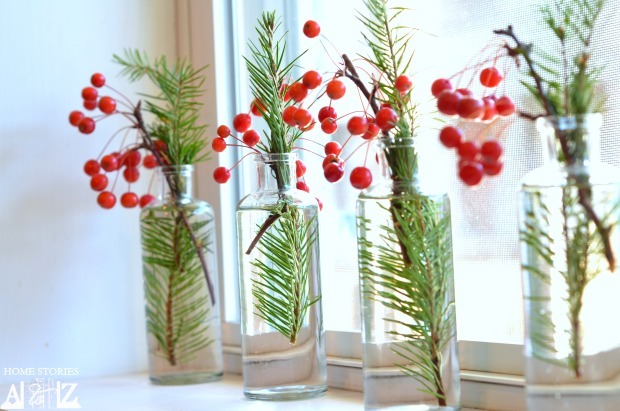 Place a sprig of evergreen with a sprig of berries in small glass bottles to create a pretty display for your windowsill. 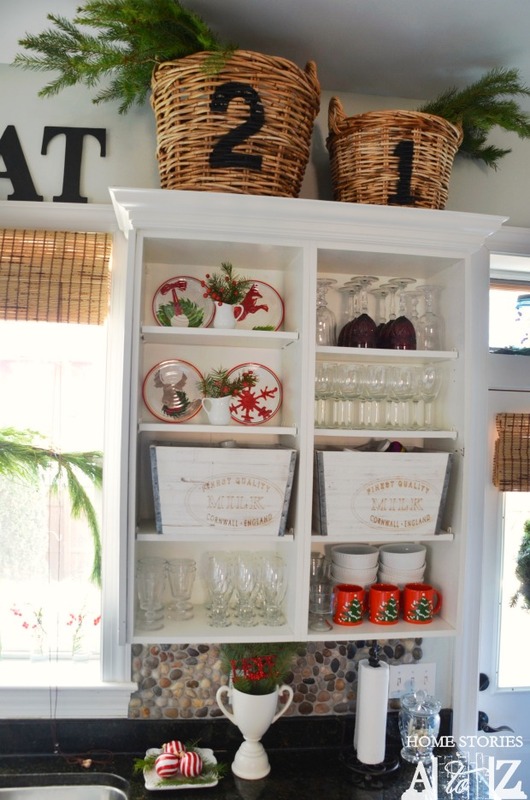 Tip 3: If you have open shelving, show off your Christmas dishes! I took the doors off a few of my kitchen cabinets several years ago, and I love the freedom it gives me to decorate for the seasons. These shelves usually house my blue-themed dishes, but I changed them out to reflect my red and white Christmas theme. Inexpensive Target melamine plates add a lot of cheer to the shelves! The Christmas mugs were a gift from my little sister and are identical to the set we grew up with. Hot chocolate somehow just tastes better in them! Tip 4: Wrap your refrigerator to resemble a present. It’s the simplest touches in decorating that make me smile the most. 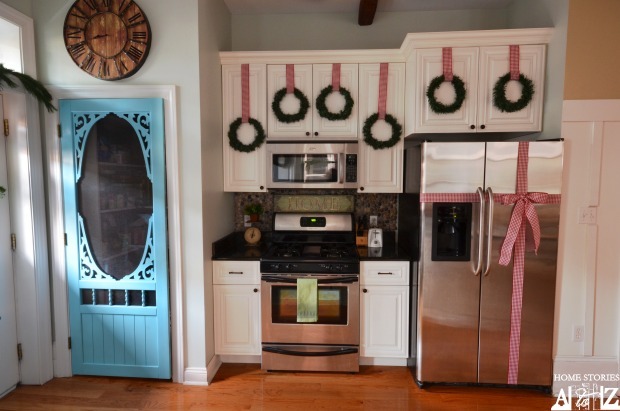 Using ribbon to dress up the refrigerator takes just a few minutes but adds some whimsy to the kitchen! 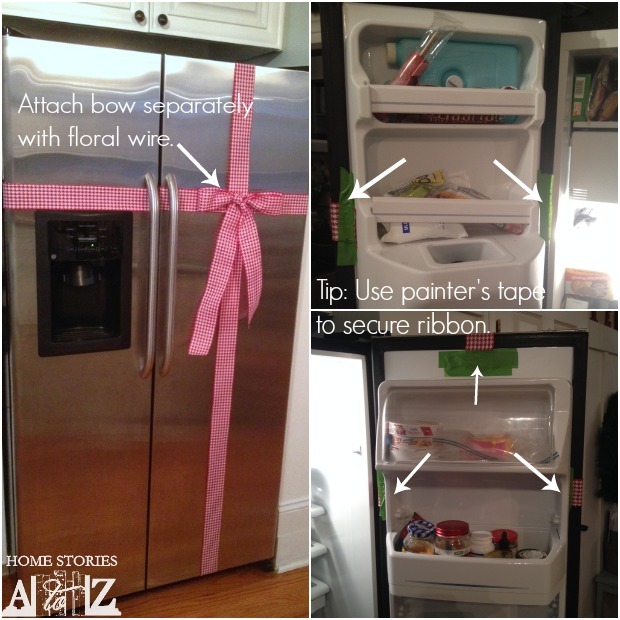 You can create a bow to fit your type of refrigerator using the same techniques as outlined in the photo below. All you need is ribbon, a roll of painter’s tape, and a piece of floral wire or beading wire to attach the bow. 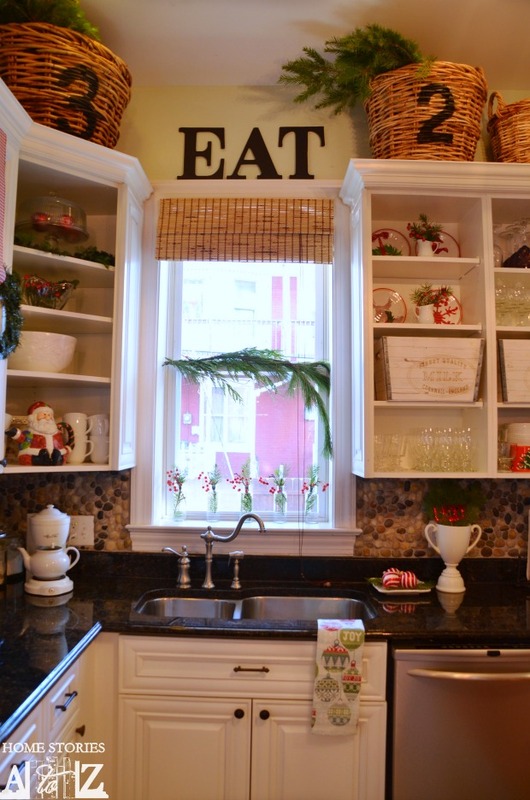 I hope you feel inspired to add some Christmas cheer to your kitchen this year! Thanks for stopping by and feel free to pin any of the images to share with your friends or for future reference. 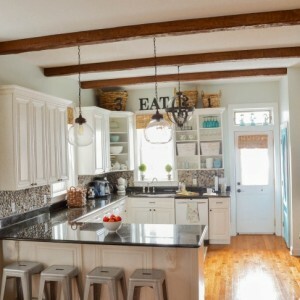 Gorgeous, adorable kitchen decor. But , can we talk for a minute about your coffee pot? Did the tea pot come with it?? Or did you do some kind of DIY magic there. Or is it just there for decor? I’m in love with it. That is my favorite appliance EVER! It’s called a Mrs. Tea and it came out back in the mid-90’s by Mr. Coffee. My mom had one, and I loved it so bought one for myself. When it wore out my husband bought me another one off of ebay. They stopped manufacturing the product after a few years time, but you can still find them for sale on ebay (although they are outrageously priced). The Mrs. Tea makes an entire pot of yummy tea from one tea bag. I use it all winter long and yes, that adorable tea pot comes with it :). So many great ideas! 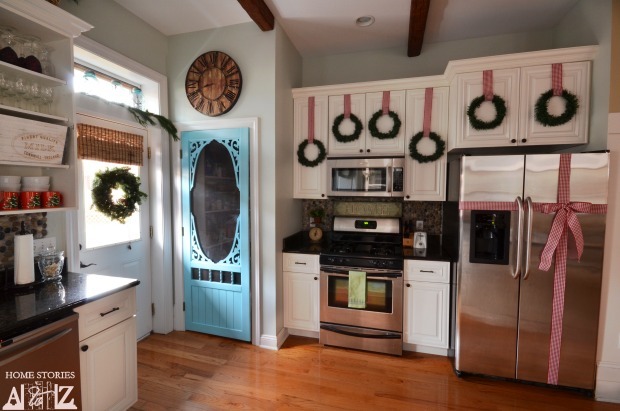 Love the wreaths on the cabinets so simple but elegant! Beth, your creativity is always inspiring! Your home shows comfort, warmth and love.